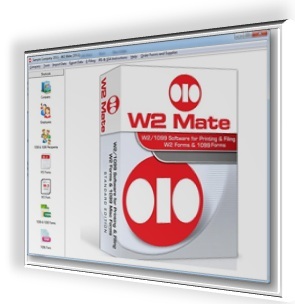 Our W2 Mate® software now supports printing 8.5 X 14 inch pressure seal W2’s. Copy C for the employee’s records on the top left corner. Copy B to be filed with the employee’s federal tax return on the top right corner. Copy 2 to be filed with the Employee’s state, city or local tax return. This copy appears twice right under copies C and B.
W2 Form instructions will be already printed on the back of the pressure seal form. The bottom part of the pressure seal W2 includes the employer’s and employee’s addresses. “Pressure Seal 4-Up Format (use with folding machines)”. The screenshot below shows how a pressure seal W-2 form generated from inside W2 Mate looks like. Click here to learn more about W2 Mate and pressure seal W2 forms. 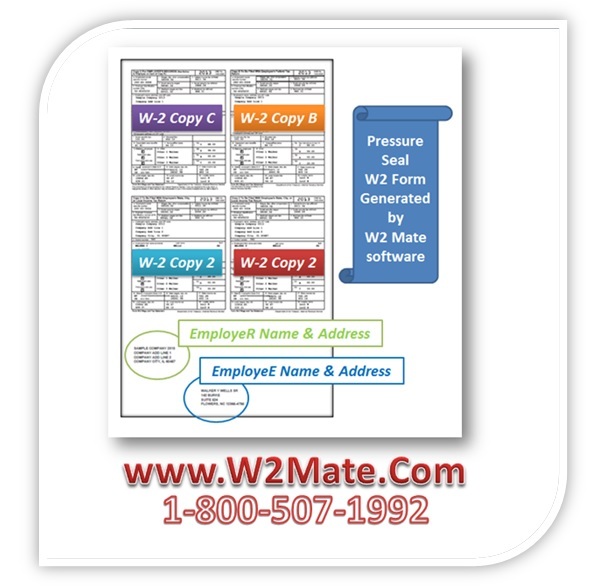 W-2 W-3 : How Employers can use W2 Software to Print W2 W3 Forms. 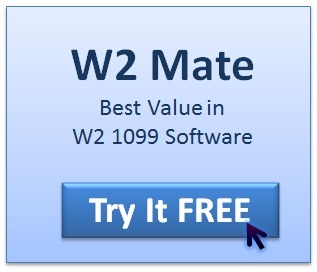 W2 W3 forms can be printed using our W2 Mate software without the need for purchasing or ordering laser forms. Our W2 program can print an unlimited number of IRS W2 and W3 tax forms on regular white paper using a regular printer. Most employers and payroll departments can benefit from this feature, and helps them go through the tax season smoothly and efficiently. (1) Forms must be printed on 8.5 x 11-inch single-sheet paper only. There must be two Forms W-2 (Copy A) printed on a page. There must be no horizontal perforations between the two Forms W-2 (Copy A) on each page. (2) All forms and data must be printed in nonreflective black ink only. (3) The data and forms must be programmed to print simultaneously. Forms cannot be produced separately from wage data entries. (4) The forms must not contain corner register marks. (5) The forms must not contain any shaded areas, including those boxes that are entirely shaded on the red-ink forms. (6) Identifying numbers on both Form W-2 (“22222”) and Form W-3 (“33333”) must be preprinted in 14-point Arial bold font or a close approximation. (7) The form numbers (“W-2” and “W-3”) must be in 18-point Arial font or a close approximation. The tax year (for example, “2010”) on Forms W-2 (Copy A) and W-3 must be in 20-point Arial font or a close approximation. (8) No part of the box titles or the data printed on the forms may touch any of the vertical or horizontal lines, nor should any of the data intermingle with the box titles. The data should be centered in the boxes. (9) Do not print any information in the margins of the substitute black-and-white Copy A and W-3 forms (for example, do not print “DO NOT STAPLE” in the top margin of Form W-3). (10) The word “Code” must not appear in box 12 on Form W-2 (Copy A). (11) A 4-digit vendor code preceded by four zeros and a slash (for example, 0000/9876) must appear in 12-point Arial font, or a close approximation, under the tax year in place of the Cat. No. on Form W-2 (Copy A) and in the bottom right corner of the “For Official Use Only” box at the bottom of Form W-3. Do not display the form producer’s EIN to the left of “Department of the Treasury.” The vendor code will be used to identify the form producer. (12) Do not print Catalog Numbers (Cat. No.) on either Form W-2 (Copy A) or Form W-3. (13) Do not print dollar signs. If there are no money amounts being reported, the entire field should be left blank. (14) The space between the two Forms W-2 (Copy A) is 1.33 inches.